A photo taken by a Western journalist shows Ukrainian troops menacing a reporter for Russian news outlet LifeNews and forcing him to get on his knees at a checkpoint between the Kharkov and Donetsk regions in eastern Ukraine. This latest incident in a series of violations of journalists’ professional rights in Ukraine occurred as LifeNews’ correspondent, Sergey Golyandin, attempted to talk to armed people about making a report at the checkpoint Friday. The journalist was only fulfilling his duties as a correspondent for the TV channel and tried to obtain non-classified information, LifeNews said on its website. 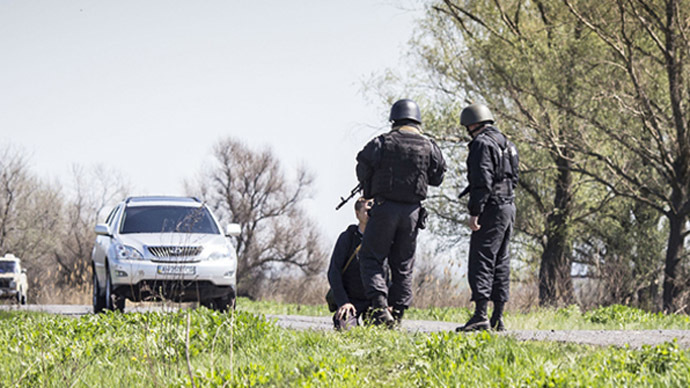 The checkpoint was located not far from the Barvenkovo railway station, through which Kiev troops were redeployed ahead of the military operation against anti-government protesters in the town of Slavyansk, Golyandin told RT. He said their crew got to the venue in a taxi and – when they saw foreign journalists being thoroughly searched – decided not to risk continuing and stopped. Golyandin decided first to have a talk with the armed people at the site and ask them if he could interview any of them and film. The reporter said he held his press card in his right hand, so that the military could see it. However, as he was about 30 meters from the checkpoint, guards on the perimeter of the facility “pointed machine guns at me,” he said. “I was told in rather a rude way to lie on the ground, face down. I bent on my knees. Two guys with machine guns and another person with a gun approached me on one side, and two more guys with machine guns on the other,” he said in a comment to RT. The military behaved in “a pretty aggressive” way, he noted. Only after they found that he was a journalist was Golyandin allowed to get back on his feet and talk to them for some time. Still, they banned the journalist from using his camera and filming anything. However, in a private conversation the soldiers told the Russian journalists that “they do not want a war,” Golyandin said. In their opinion Right Sector’s special forces Dnepr-1 and Dnepr-2 are behind “all provocations and firing at checkpoints,” Golyandin said. 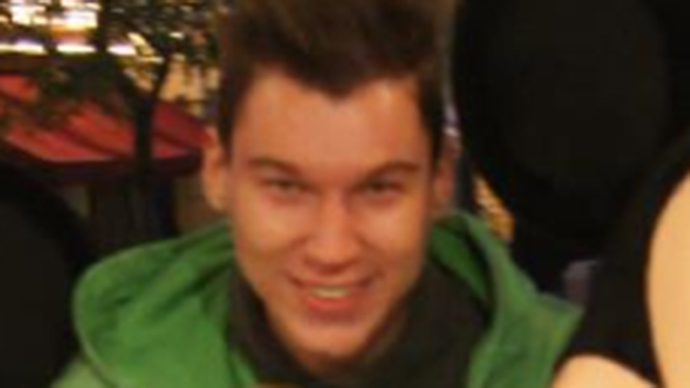 “Then we were told to get out of the place as soon as possible,” the LifeNews reporter added. The incident was recorded, however, by a foreign correspondent present at the site and the image was later posted in Global Look Press and other photo banks. 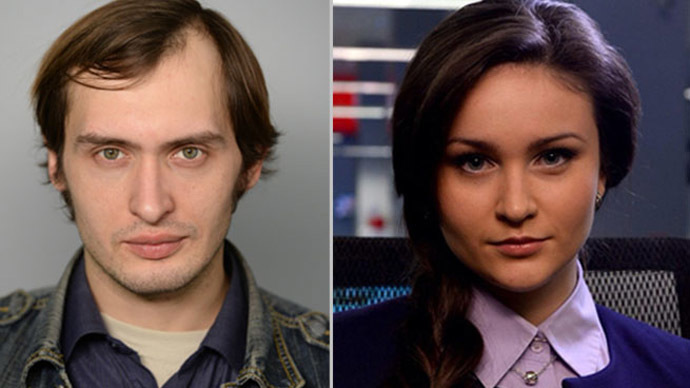 In a separate incident this week, two LifeNews journalists were detained by the Ukrainian Security Service (SBU) while they were filming an interview with an opposition leader and then deported to Russia. 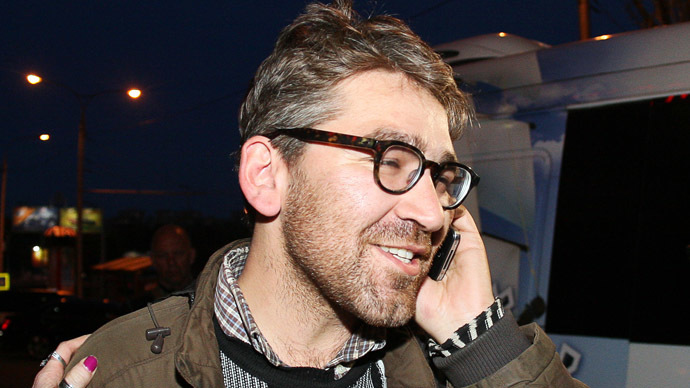 On Monday, Simon Ostrovsky, a journalist for the New York-based Vice News, was detained by self-defense forces in Slavyansk, eastern Ukraine. He was released three days later, on Thursday. 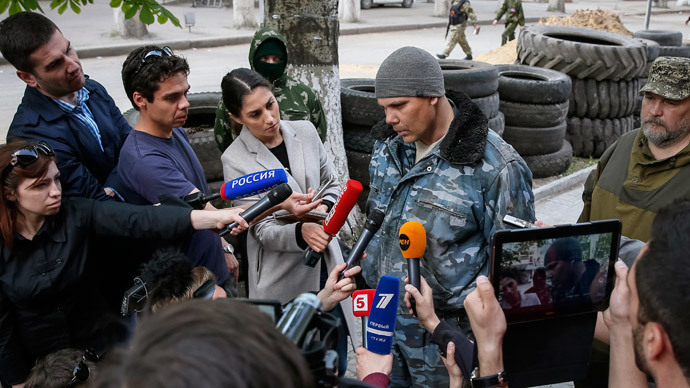 Lately, there have been an increasing number of incidents with Russian journalists on Ukrainian territory, with reporters being detained, questioned for hours, threatened, deported or banned from entering the country.